WITS Interactive created an ePub for the publishers Lubbe. 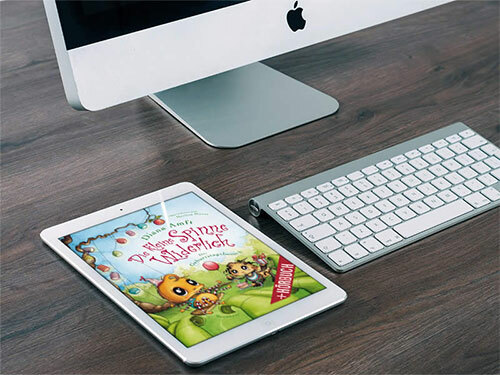 Die Kleine Spinne Widerlich ePub is created for kids. A series of 2 books namely Die kleine Spinne Widerlich and Die kleine Spinne Widerlich - Der Geburstagsbeuch is about a little spider and its journey. Kleine Spinne Widerlich and Die kleine Spinne Widerlich - Der Geburstagsbeuch were made in German language with a simple fixed layout structure, with built-in features of read aloud, to draw the interest of the kids while reading. For Die kleine Spinne Widerlich - Der Geburstagsbeuch we made a Kf8 version without the read aloud function which was also a fixed layout ePub. A simple yet noteworthy ePub delivered!